I have a div with two images and an h1. All of them need to be vertically aligned within the div, next to each other. One of the images needs to be absolute positioned within the div. What is the CSS needed for this to work on all common browsers? I think this solution is the quickest and easiest to understand. Perhaps it's because I wasn't patient enough to grok the selected answer. Flexbox all the things! Understanding vertical-align, or "How (Not) To Vertically Center Content" by Gavin Kistner. “How to center in CSS” is a great web tool which helps to find the necessary CSS centering attributes for different situations. … there are more such special cases. The problem with the "valid" solutions (so not the vertical-align: middle) is that you have to specify a fixed height. Not very possible for Responsive Web Design. This also works with inline-block and table-cell elements. If you are having issues with this, try adjusting line-height of the container element (i.e. context) since it is used in the vertical-align line box calculations. Understanding vertical-align, or "How (Not) To Vertically Center Content could have done better with the latest standards. All modern browsers now support transform: translateY(-50%) (although you still have to add the prefix like webkit, mz etc). Using this instead of margin-top: -yy would be a better fit. @DazzleR “Understanding vertical-align, or "How (Not) To Vertically Center Content” predates the latest standard (rather, its adoption) by more than a decade. ;-) — I’d add it, but other answers already include it. @KonradRudolph There is no denying that it predates even my puberty! :-P It is just that things will be much easier for newbies if green ticked answer would contain answer with updated standards, don't you think? @GauravJain Sure does: make it inline and give it vertical-align: middle, or keep it block and set its margin-top. Your example is mixing block-level and inline-level alignment hints. <img> isn’t special in any way, it behaves like any other element here. As per my understanding, immediate parent of text containing element must have some height. I hope it will help you too. Thanks! We may use a CSS function calculation to calculate the size of the element and then position the child element accordingly. This solution works well with responsive div height and width as well. Note: The calc function is not tested for compatiblity with old browsers. I'm just posting everything from my test. It's probably not overly elegant, but it works so far. The "a" element converted to a button, using Bootstrap classes, and it is now vertically centered inside an outer "div". Just use a one-cell table inside the div! Just set the cell and table height and with to 100% and you can use the vertical-align. A one-cell table inside the div handles the vertical-align and is backward compatible back to the Stone Age! Works just for a single line.. I've never seen in css this kind of selector "#outer[id]". What should that do? What if I will have class instead of id? So it's no longer "block" element? Obviously, whether you use a .class or an #id, the result won't change. A nice solution, thank you. Can you suggest how to make flexbox display a horizontal scrollbar, in case the inner element is bigger than the container? (I'm trying to make inner element zoomable/scrollable within the container, like canvas in powerpoint)? Is it possible at all? Doesn't this solution work on IE8?! @YazidErman this solution depends on flexbox so no, only IE 10 and above support or any other modern browser caniuse.com/#search=flexbox Flexbox is great where it's supported but that's not everywhere. The display table and table cell is probably the best solution really, container just needs to be table, element being centered is wrapped an element with display table cell then can just center as some other answers here point out. My trick is to put inside the div a table with 1 row and 1 column, set 100% of width and height, and the property vertical-align:middle. This seems the best way to avoid a lot of head-scratching. I'm still confused as to why CSS doesn't have a vertical align standard. I have been using the following solution (with no positioning and no line height) since over a year, it works with IE 7 and 8 as well. Almost all methods needs to specify the height, but often we don't have any heights. 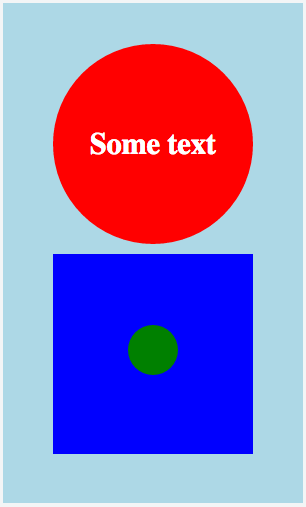 So here is a CSS3 3 line trick that doesn't require to know the height. It's supported even in IE9. but this seems work only when the height of element's parent is fixed. the property 'top' with percentage value only works in the container with fixed height, correct? The vertical-align property does not apply since the div is display: block by default and nothing appears to have been done to change it. Apparently the display was updated to table-cell, which makes vertical-align: middle; work. Even better, it works without needing a nested wrapper/buffer div, and it works for both text and images (or both), and you don't need to change the position properties. This one works. It changes the display to table-cell which takes the vertical-align property. No idea why people vote this down. By default h1 is a block element and will render on the line after the first img, and will cause the second img to appear on the line following the block. If you can get that to work, you might want to try progressively removing the height, width, position attributes from div.header to get the minimal required attributes to get the effect you want. <img src="#" alt="Image 2" width="40" height="40"
I should note that having the right DOCTYPE can sometimes make big differences to how CSS will render, especially on Internet Explorer. I'd recommend you chose a DOCTYPE known to align with a strict standards mode so you can expect more consistent behaviour between browsers. Aligned how? Tops of the images aligned with the top of the text? Absolutely positioned relative to the DIV? Perhaps you could sketch out what you're looking for...? [SOLVED] How to disable text selection highlighting?